Field test results show that the TSUBAKI Ultra Super Series has a greater ultimate tensile strength and allowable load than any other roller chain manufactured. With 170% higher allowable load than ANSI RS standard roller chains, the Ultra Super Series allows selection of a chain up to 2 sizes smaller than standard. Excellent for applications where heavy shock loads or space limitations pose problems. RS standard sprockets can be used, if the sprocket teeth have been hardened and the sprocket is not of the cast-iron type. Max. chain speed is 50 m/min. Offset links are not available. 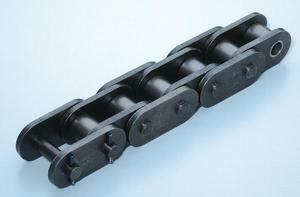 Riveted type chains will be supplied unless otherwise specified.